The Shihu (Ten Tablet) Garden, also known as the Ding Family Garden, is situated at Hujia Paifang Street in Weicheng District. During the Ming and Qing dynasties it was the residence of a high official. 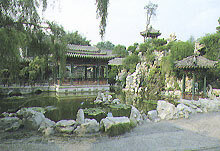 In 1885, or the 11th year of the Guangxu Reign of the Qing Dynasty, a man by the name of Ding Shanbao converted it into a private garden. Because of its tiny size, the local people joked that it was no larger than ten wooden tablets put together. Hence the name, "Ten-Tablet Garden". The garden's 2,000 square meters of space is clustered with 67 buildings - pavilions, terraces, kiosks, studies and guest rooms which are connected by zigzag bridges and a winding corridor. The atmosphere is enlivened by the presence of a fishpond and an artificial mountain. The Chunyu Chamber, the Qilan Pavilion, the Water Curtain Cave, and the tiny waterfall are all man-made structures yet they look like born of nature. The walls are imbedded with calligraphic works by Zheng Xie and Jin Nong, who were among the Eight Eccentrics of Yangzhou. In a display room authentic calligraphic works and paintings by artist that belonged to the Yangzhou school traditional Chinese painting are on display. The garden is under protection as a key cultural relic.